Trayvon Martin is dead and he should still be alive. He should be experiencing what other kids his age are going through now. Looking to finish high school. Getting prepared to go to college. Spending time with his friends and family. But he doesn't get to do any of those things because a self-appointed protector of his community felt that Trayvon was "suspicious" and caused an encounter that led to the death of this 17-year-old young man. I first wrote about this story two weeks ago, days before it became a national headline. My home is about a half-hour from where Trayvon's death took place and this tragedy has hit close to home for me, both literally and figuratively. I'm a Christian who is a white evangelical and those like me have been accused of not caring about the death of Trayvon. But I do care. 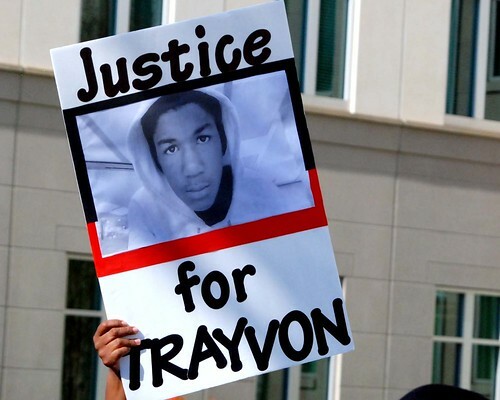 I haven't remained quiet about this and I won't remain silent about it until Trayvon's killer is brought to justice. If our "Stand Your Ground" law says that a man can ignore the instructions of the police, kill an unarmed young man that was doing nothing wrong and not be arrested, then that law needs to be changed. I care about the death of Trayvon because I've invested most of my adult life in young men just like Trayvon and I'm sick and tired of black men being targeted as criminals for no other apparent reason than they have brown skin. I care about the death of Trayvon because I've heard too many horror stories from African American friends of having store employees confront them about stealing merchandise or squad cards surrounding them or guns pulled on them because they "fit the description." I care about the death of Trayvon because I'm appalled of how black life is devalued in our culture and how the benefit of the doubt is given to the criminal rather than the victim. I care about the death of Trayvon because I'm weary of my Christian brothers and sisters saying they care about injustice in other parts of the world while ignoring the injustices within our own communities. I care about the death of Trayvon because of the way our society often assumes that black men are "up to no good" in ways that those that look like me aren't. I care about the death of Trayvon because "flour bombing" a Reality TV starlet leads to an immediate arrest but killing a kid does not. I care about the death of Trayvon because I have sons that like Skittles and wear hoodies and a man that killed someone not much older than them is somewhere on the loose in the area in which I live. I care about the death of Trayvon because although I identify in many ways with the black community, I realize that the color of my skin affords me privileges that I have not earned nor deserve and I am spared from certain realities that I will never have to experience. I care about the death of Trayvon because I realize that this case is about more than one lost life, as tragic as that is. It represents countless numbers of African Americans who were denied "life, liberty and the pursuit of happiness" in a country that supposedly treats everyone as equals. I care about the death of Trayvon because those that I love care about the death of Trayvon. I care about the death of Trayvon because I'm a follower of Jesus and my God cares deeply about injustice -- no matter who is experiencing it. I care about the death of Trayvon Martin. Will you care, too? If you want to let your voice be heard, join me and over 1.5 million who have signed the petition asking for justice for Trayvon. You can sign the petition here. Right on Scott! This fits perfectly with the conversation that we had last night at work. Thanks for blogging about this weeks ago. I care too...man do I care. One of your best posts. Ever. Even when reading it again after Zimmermans side has been told. It doesn't change why we should/need to care. Asians Are Fastest Growing Racial Group in U.S.